Salento is a green paradise in the middle of Colombia. The colourful pueblo located at an altitude of 2000m is surrounded by lovely mountains and vegetation. Arriving form Cali, I had to take 2 buses: one to Pereira and then one to Salento. Quite a long trip: 6 hours (if everything goes right…). We were stopped for about more than an hour because of road works in complete darkness with no information whatsoever from the driver. I stayed in an awesome boutique hostel in Salento: the Coffee Tree Boutique Hostel. It’s on the other side of the village but no worries, it’s not a long walk and the city is 100% safe to walk at night. The hostel is modern and spacious with a peaceful garden and incredible views on the mountains. I had the chance to stay in the 4-bed room in the “barn” on the side of the villa. Super quiet and with a bathroom way better than my own! Breakfast is delicious too and you can choose between pancakes and eggs. Cherry on the cake for dog lovers: a giant St Bernard sleeps here too! Alternative: when you get out of the bus and walk around the village, several people will offer to host you as soon as they see your backpack. You can taste the typical dish of Salento a bit everywhere. 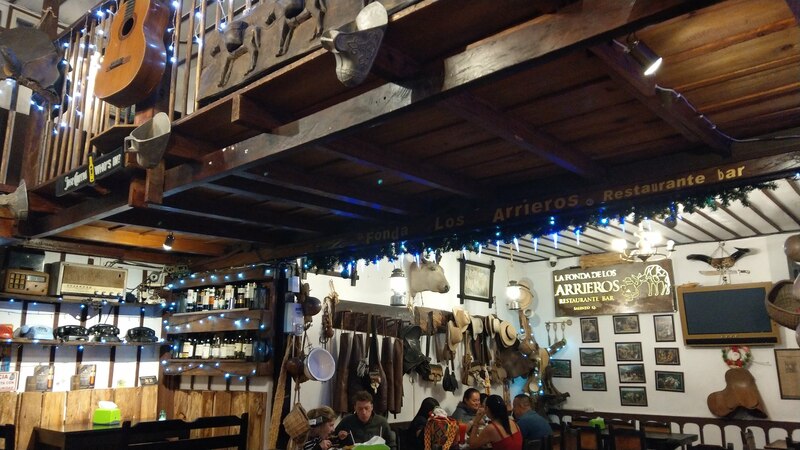 I chose to eat the trucha dorada con patacones at La Fonda de los Arrieros on the main square. Really recommending it! If you miss a good English curry, head to Casa La Eliana (also a hostel) and order a tikka massala or a veg curry. Gourmet food for travelers is their motto! And for more world food, you can taste some Israeli food (but also burgers and pasta) at the Shakshuka, close to the hostel. 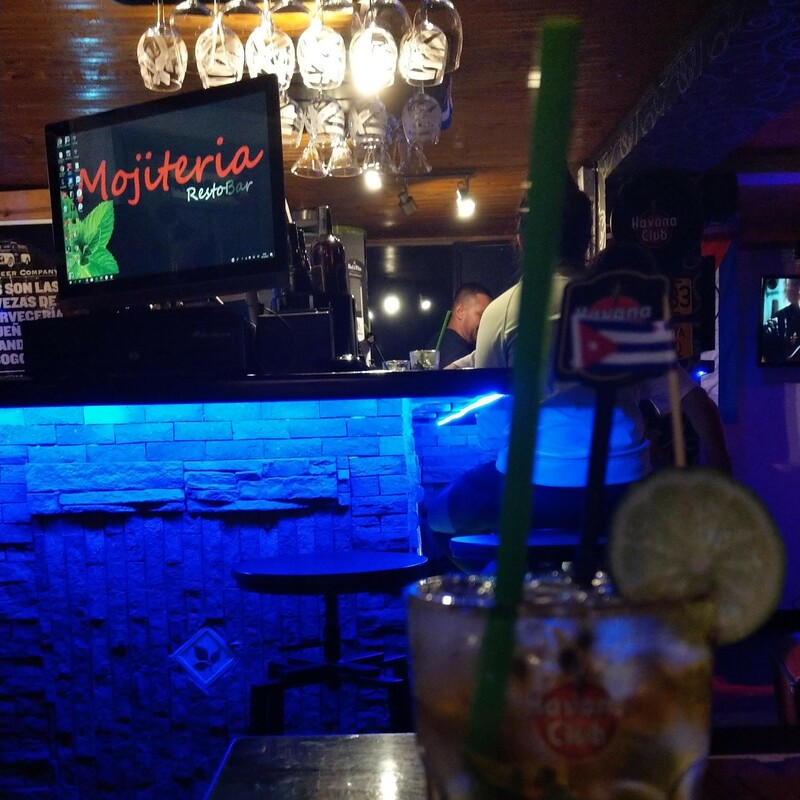 For mojitos aficionados like me, I found the perfect place: La Mojiteria. The reason number 1 for most people to come to Salento is definitely the Cocora Valley. Jeeps leave to the Ruta de la Reserva Acaime every hour in the morning from the Parque Central (8000 pesos there and back) for a 20-minute ride. Tip: don’t start right next to the car park where locals will invite you to ride a horse but walk straight up to reach the actual entrance where you will need to pay a small fee to start the trek (3000 pesos). This way will be nicer, easier and less tiring. I saw the palmtrees of the Cocora Valley a few months before my trip on television and literally fell in love. And the reality is even better of course! These super tall palma de cera (between 40-60m!) are so impressive. I first walked for about 2 hours nearly by myself just looking up and taking tens of pictures. The trek began to be steepier and steepier until I reached the Finca La Montaña located at an altitude of 2 270m. Then I entered a real jungle to go to the Reserve of Hummingbirds (not that many of them but really cute). The second part of the trek was really different from the first one but also great: I felt like an adventurer walking on broken bridges and exploring the tropical jungle. You still have a bit of walking to do once you get out of the jungle and on the way, if you’re not too exhausted, you can visit a trucheria and feed the fish. It would be a pity to leave Salento without visiting the city. After climbing 240 steps at the end of Carrera 6 (plenty of souvenirs shops here! ), you’ll get a beautiful view on the colourful city made of pink hotels, yellow shops and blue houses. 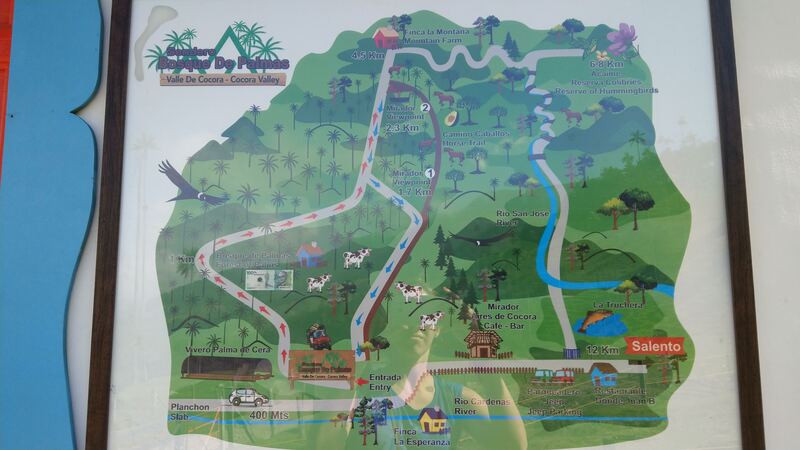 From there, you can walk to the other mirador to stare at the stunning countryside with Río Quindío at the bottom (go on a horse ride if you have time!). You will have understood… I left Salento with a big smile on my face. PS: If you can’t live without coffee, you can also visit some finca around. I’ve never drunk a sip of coffee in my life so the hostel guys advised me not to go. The most famous ones are Finca Don Elias and Finca El Ocaso.